Eleven GOP members of Congress led by Rep. Ron DeSantis (R-FL) have written a letter to Attorney General Jeff Sessions, Attorney John Huber, and FBI Director Christopher Wray - asking them to investigate former FBI Director James Comey, Hillary Clinton and others - including FBI lovebirds Peter Strzok and Lisa Page, for a laundry list of potential crimes surrounding the 2016 U.S. presidential election. Recall that Sessions paired special prosecutor John Huber with DOJ Inspector General Michael Horowitz - falling short of a second Special Counsel, but empowering Horowitz to fully investigate allegations of FBI FISA abuse with subpoena power and other methods he was formerly unable to utilize. The GOP letter's primary focus appears to be James Comey, while the charges for all include obstruction, perjury, corruption, unauthorized removal of classified documents, contributions and donations by foreign nationals and other allegations. The letter also demands that Deputy Attorney General Rod Rosenstein "be recused from any examination of FISA abuse," and recommends that "neither U.S. Attorney John Huber nor a special counsel (if appointed) should report to Rosenstein." James Comey - obstruction, perjury, corruption, stealing public property or records, gathering transmitting or losing defense information, unauthorized removal and retention of classified documents, false statements. "Comey's decision not to seek charges against Clinton's misconduct suggests improper investigative conduct, potentially motivated by a political agenda." The letter calls Comey out for leaking his confidential memos to the press. "In light of the fact that four of the seven memos were classified, it would appear that former Director Comey leaked classified information when sharing these memos..."
Comey "circulated a draft statement" of the FBI's decision to exonerate Hillary Clinton for mishandling classified information - a conclusion reached before the agency had interviewed key witnesses. "At that point, 17 interviews with potential witnesses had not taken place, including with Clinton and her chief of staff..."
The letter also seeks clarification on "material inconsistencies between the description of the FBI's relationship with Mr. Steele that you [then FBI Director Comey] did provide in your briefing and information contained in Justice Department documents made available to the Committee only after the briefing." "A lawyer representing the Clinton campaign and the Democratic National Committee paid Washington firm Fusion GPS to conduct research that led to the Steele dossier..."
"Accordingly, for disguising payments to Fusion GPS on mandatory disclosures to the Federal Election Commission, we refer Hillary Clinton to DOJ for potential violation(s) of 52 USC 30121 and 52 USC 30101"
"We raise concerns regarding her decision to threaten with reprisal the former FBI informant who tried to come forward in 2016 with insight into the Uranium One deal." "During the internal Hillary Clinton investigation, Mr. McCabe "lacked candor -- including under oath -- on multiple occasions," the letter reads. "That is a fireable offense, and Mr. Sessions said that career, apolotical employees at the F.B.I. and Justice Department agreed that Mr. McCabe should be fired." "The DOJ Office of the Inspector General recently released a February 2018 misconduct report... confirming four instances of McCabe's lack of candor, including three instances under oath, as well as the conclusion that McCabe's decision to confirm the existence of the Clinton Foundation Investigation through an anonymously sourced quite violated the FBI's and DOJ's media policy and constituted misconduct." "We raise concerns regarding their interference in the Hillary Clinton investigation regarding her use of a personal email server." Referring to a Wall Street Journal article from January 22, 2018 - "The report provides the following alarming specifics, among others: "Mr. Strzok texts Ms. Page to tell her that, in fact, senior officials had decided to water down the reference to President Obama to 'another senior government official." By the time Mr. Comey gave his public statement on July 5, both references - to Mr. Obama and to "another senior government official" had disappeared." "Department of Justice (DOJ) and FBI personnel connected to the compilation of documents on alleged links between Russia and then-presidential candidate Donald Trump known as the "Steele dossier." "we raise concerns regarding the presentation of false and/or unverified information to the Foreign Intelligence Surveillance Court in connection with the former Trump aide Carter Page"
"Former and current DOJ and FBI leadership have confirmed to the Committee that unverified information from the Steele dossier comprised an essential part of the FISA applications related to Carter Page"
"Accordingly we refer to DOJ all DOJ and FBI personnel responsible for signing the Carter Page warrant application that contained unverified and/or false information"
It has been interesting to see the overt double standards of media with regard to politics. It appears that former government figures have been groping for media attention—despite the fact that their terms officially ended months ago—are still heavily intent upon smearing every move the current administration makes. Though it is important to uphold the freedom to criticize authority, these former officials do not seem to be interested in receiving any criticism themselves. Instead, this handful of former government figures seems particularly interested in deflecting all criticism against themselves and either fabricating counter-claims or projecting their own flaws onto the opposition. Either way, it does not appear that former officials such as James Comey and Rod Rosenstein have any intent to own up to the mistakes they made while in office. Now that these figures are facing serious charges, there appears to be a substantial motive for them to deflect as much negative attention from themselves as possible. It also appears that these questionable parties are using comedy shows and entertainment to communicate their own agendas to the public. Even in venues that have nothing to do with politics, such as entertainment and late night talk shows, these political figures keep showing up. Their television networks of choice also happen to be owned by the Clintons or those who backed the Clinton campaign during the 2016 election. Yet even though the election has long-since ended, we still see the tactics of campaign candidates being used for what appears to be damage control in preventing any further incriminating news from reaching American audiences. One convenient aspect of late-night comedy shows is that a politician can say whatever they want without being charged with perjury. Unlike a congressional hearing or military tribunal, politicians can give any monologue they wish on late-night talk shows without consequence. 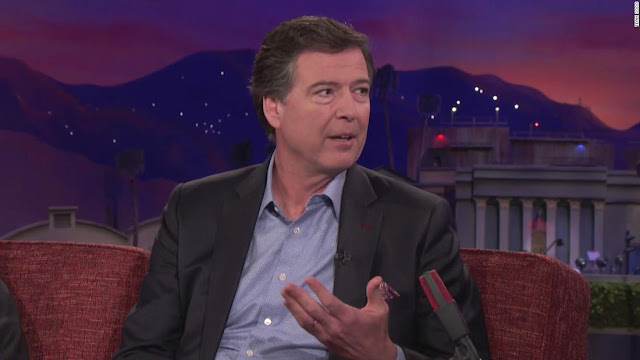 This may explain why James Comey chose the Conan show on TBS as his platform instead of waiting until an official hearing to make the claims he made that evening. To add, when Comey claims that the investigation into democratic parties spying on the Republican campaign is a fraud, he fails to explain why the Russia investigation was any more valid. The agencies involved in these investigations are supposedly the same. It seems that when Comey and his former cohorts are the target, they claim that there is no reason to investigate. Yet when the president is the target, the investigation is unconditionally legitimate. Why would the United States government be incapable of enforcing the law objectively? Further, if the American government is bias in these cases, how do we determine who is on the losing end? If what Comey was saying on Conan was true, why not let the official investigation do the talking? If Comey was honest with his words that evening, why tell them to the American people who have no say in his criminal investigation? There does not seem to be much of a purpose to speaking about this subjects in entertainment other than an attempt to continue the alleged psychological warfare being waged between the former establishment and the current one. Below is a video of a very unexpected and revealing press conference held by congressional representatives, and gives the American public the true opinion of the situation regarding James Comey and the rest of the suspects of the former administration. With revelations like these, it becomes easy to see why Comey and friends are so nervous.